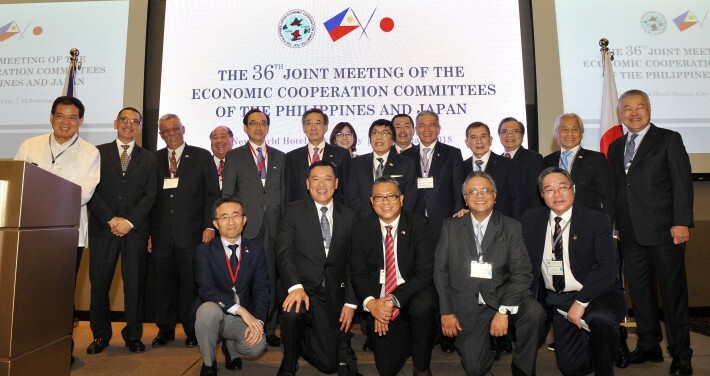 Members of Philippines-Japan Economic Cooperation Committee, Inc. (PHILJEC) and its counterpart, Japan-Philippines Economic Cooperation Committee (JPECC) convened last February 22, 2018 for their 36th joint meeting held at the New World Hotel in Makati City. This year’s meeting focused on the theme “Build, Build, Build: The Duterte Administration’s Infrastructure Plan for Sustainable Growth” and had top-level diplomats, representatives from the Japanese business community, and Filipino industry leaders as speakers and attendees. PHILJEC and JPECC Chairmen Atty. Aniceto G. Saludo, Jr. and Mr. Teruo Asada respectively welcomed the participants with their opening remarks, both stating that the two countries are in a “Golden Age of Partnership”. In their speeches, the two chairmen emphasized the much-needed infrastructure projects such as the first major subway in Metro Manila and other railway projects in South and North Luzon and how the cooperation and strong political will in completing these projects will surely sustain Philippine economic growth and revitalize Japan’s economy as well. Philippine Ambassador to Japan, Jose C. Laurel V, read the congratulatory message from President Rodrigo Duterte, while Ambassador Koji Haneda read that of Prime Minister Shinzo Abe. Japan has been among our country’s largest investors and trading partners while Philippine companies and workers have likewise contributed to the dynamism and vibrancy of the Japanese economy. I look forward to this joint meeting, as it will not only have the potential of expanding cooperation to other emerging sectors, but will also serve as a lynchpin for greater stability and peace within our region (read full message). Top-level diplomatic and bilateral Japan-Philippines relations have never been as close and vibrant as they are today. I sincerely welcome the development of various infrastructure facilities in the Philippines through the “Build, Build, Build” policy spearheaded by the Duterte Administration. Japan will continue to contribute vigorously towards the improvement of Philippine infrastructure in order to boost it up to even higher. I congratulate PHILJEC and JPECC for holding today’s meeting and hope that you will have a most fruitful and productive conference leading to even deeper Japan-Philippines economic relations (read full message). Also present to give the keynote address was National Economic and Development Authority (NEDA) Secretary Ernesto Pernia and Special Guest Speaker, Department of Transportation (DOTr) Secretary Arthur Tugade who entertained questions regarding the implementation of the “Build, Build, Build” Program. For this year’s meeting, two plenary sessions were held featuring presentations from significant players in the infrastructure projects. BDO Capital and Investment Corporation President, Mr. Eduardo V. Francisco and JICA Philippines Chief Representative, Mr. Susumu Ito discussed the financial aspects in the first plenary session. This included details about funding sources both from Japan’s Official Development Assistance (ODA) and from the local private sector. To view all related presentations and speeches from the 36th PHILJEC-JPECC meeting, please refer to our “Resources” below. Members of PJLA welcomed 2018 with a colorful “Shinnenkai” or New Year’s party on January 17 held at the Milky Way Café in Arnaiz Avenue, Makati City. This year’s gathering had a special welcome for Madame Ihoko Haneda, wife of Mr. Koji Haneda who is the new Ambassador of Japan to the Philippines. Mrs. Ma. 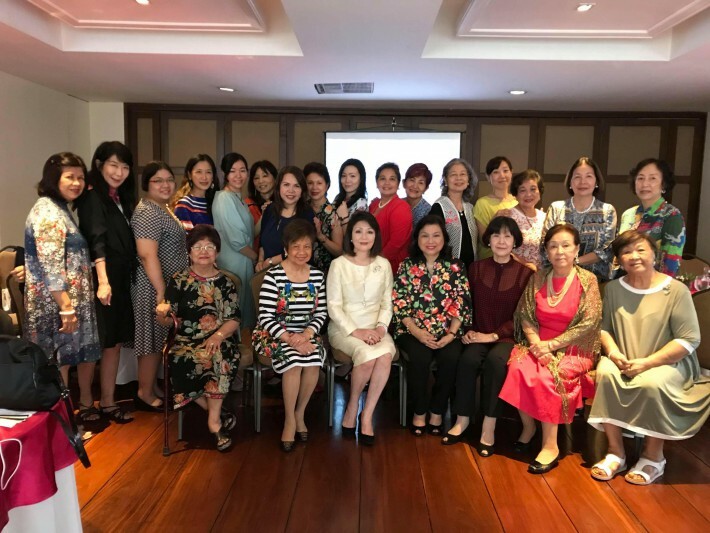 Elena Laurel-Loinaz, PJLA President, welcomed the guests and members with her opening remarks and presented a bouquet of flowers to Madame Haneda, which was followed by the Ambassador’s wife’s brief acknowledgement message. The Shinnenkai party started around 2 p.m. and wrapped up around 4 p.m. after snacks and fellowship. It also served as the birthday celebration for several PJLA members who had their birthdays in November and December 2017, and January 2018. The Government of Japan conferred upon NCF President, Mr. Philip B. Sanvictores, the Imperial Decoration, The Order of the Rising Sun, Gold Rays with Rosette in fitting ceremonies held last February 9, 2018 at the official residence of H.E. Koji Haneda, Ambassador of Japan in the Philippines. The prestigious decoration recognizes Mr. Sanvictores’ decades-long efforts in furthering good relations between Japan and the Philippines through his work for the Nihongo Center Foundation (NCF), the Philippine Institute of Japanese Language & Culture (PIJLC) and the Philippine Federation of Japan Alumni (PHILFEJA). PIJLC and to the members of PHILFEJA. “This Order of the Rising Sun, Gold Rays with Rosette, truly belongs to the loyal and hardworking Nihongo sensei of PIJLC and the Nihongo Center. It also belongs to many fellow-former Filipino ryugakusei who actively support and participate in the activities of PHILFEJA, established 41 years ago to help promote Philippines-Japan and ASEAN-Japan relations,” said Mr. Sanvictores in his acceptance speech. 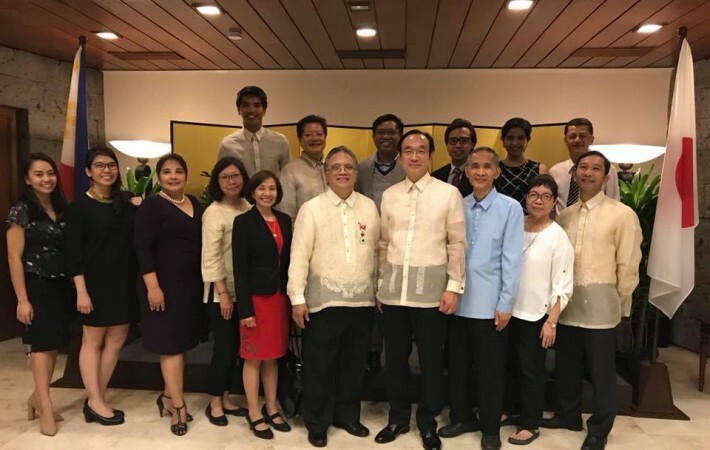 He also honored people who helped and guided him throughout his days as a ryugakusei in Japan and expressed his gratitude to those who continue to support him in his endeavors as a businessman and leader of various associations affiliated with the Philippines-Japan Society. To read the full acceptance speech of Mr. Sanvictores, please refer to “Resources” below. Mr. Sanvictores went to Japan in 1981 to study Nihongo under the 10-month Intensive Japanese Language course of Kokusai Gakuyu Kai, now known as the Tokyo Japanese Language Education Center. In 1990, upon the instructions of Ambassador Jose S. Laurel III, Mr. Sanvictores submitted an application with the Japan Foundation for a grant to dispatch a Japanese Language Teacher, who then sent Prof. Kenjiro Ogata. Even after the expiry of the said grant, Prof. Ogata remained in the Philippines and continue his work as Academic Advisor to both NCF and PIJLC, inspired by the noble and lofty ideals of Amb. Laurel for better understanding and closer friendship between Filipinos and Japanese through Nihongo. The Japan Foundation grant underpinned the establishment of the Philippine Institute of Japanese Language & Culture (PIJLC) in 1991 under the patronage of the Philippines-Japan Friendship Foundation (PJFF). In 1997, in response to an appeal by the Government of Japan, PJFF founded the Nihongo Center Foundation (NCF) to continue the work and practice of the erstwhile “Nihongo Gakko” of the Japan Information & Cultural Center. In 2014-2016, Mr. Sanvictores served as President of PHILFEJA, the umbrella organization of the different groups of former Filipino students in Japan. In 2015, under his leadership, PHILFEJA hosted the 21st Conference of the ASEAN Council of Japan Alumni (ASCOJA). In January 2016, during the state visit to the Philippines of Their Majesties, the Emperor and Empress of Japan, Mr. Sanvictores played a key role in organizing the meeting of Filipino former students and Japanese government scholars with Their Majesties, which was an integral part of the visit. Established in 1875 by Emperor Meiji, The Order of the Rising Sun is the third highest order bestowed by the Japanese Government to people who have made distinguished achievements in the fields of International Relations, Promotion of Japanese Culture, advancement in their field, development in welfare, and preservation of the environment.